Another outdoor summer movie series? Well, Los Angeles offers nothing, if not options. This time around we’re talking about the Eat|See|Hear Summer Movie Series (winner of L.A. Magazines Best Outdoor Movie Series), which runs every Saturday for 19 consecutive weeks starting May 9, 2015. 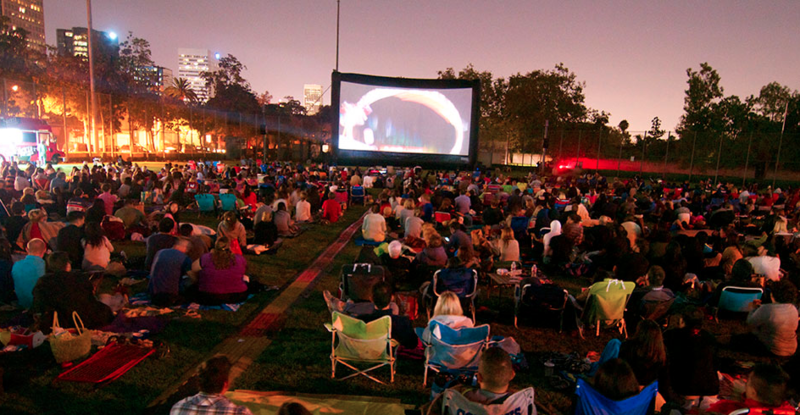 Classic movies will be screened on a 52-foot wide inflatable projection screen (badass) at four venues throughout Los Angeles: The Autry in Griffith Park, Santa Monica High School Amphitheater, Pasadena City Hall, and La Cienga Park. Each event will feature live pre-show music plus a selection of L.A.’s best food trucks (see the list below), all centered around screenings of iconic films like Beverly Hills Cop, Jaws, Back to the Future, and the Karate Kid (to name a few). Complete listing of the summer schedule is below. Also, if outdoor movie are you thing be sure to check out the Cinespia screening schedule for May (shown at the Hollywood Forever Cemetery) along with the complete summer schedule for Street Food Cinema 2015. July 18, 2015 | ¡Three Amigos! Food trucks: Wings N Waffles, Rushed Art, Creative Eats, Farmer’s Belly, Oh My Gaga, Asian Cravings, Surfer Taco, Coolhaus, Brasil Kiss and More! Note that the above food truck listings may be subject to change. You can check back for updates on the vendor listings on the official Eat|See|Hear website.